Bollywood Story Slot Review | NetEnt & Univeral in a collaboration! 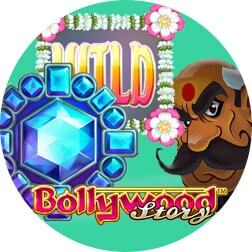 Worldwide gaming company NetEnt released the Bollywood Story online slot machine. As Bollywood is India’s version of Hollywood, this game was designed to appeal to those in India and to educate others about Bollywood. In June 2018, Netent unleashed the game to the world. Bollywood Story revolves around a young woman and man who are madly in love. However, the women’s stepmother does her best to break them up. She does this in order to force her step-daughter into an arranged marriage. Her theory is that her stepdaughter will marry a rich man so she can continue to live in her upscale house. The evil stepmother’s upscale house is the game’s setting. On the reels players will see symbols such as the lovers, the rich man and evil stepmother. The standard symbols used are pastel colored letters. A sapphire serves as the game’s scatter symbol while the logo is its wild symbol. Players are tasked with deciding the young couple’s fate. If the rich man and stepmother line up on the reels, their evil is blocked. If the young lovers line up on the reels, they remain in love. A second wild symbol is the flower garlands. When the reels are spun, two to four garlands appear. These garlands take the place of standard symbols on the reels. When players get at least three of the scatter symbols, they win free spins. While three get players 10 spins, 4 gets them 20. If they get five on the reels at once they get 30 spins for free. Each time a free spin is played the flower garlands are added to the reels. If the scatter symbols land on the reels during free spins, players get more. Though Bollywood Story may not appeal to everyone, many have already enjoyed it. Anyone who appreciates a juicy love story will likely find this game appealing. Typical Bollywood type music is heard during gameplay. This sets the mood for a fun game that players get lost in. In Bollywood, the story of lovers who face an obstacle is not uncommon. The theme is seen in many of the country’s movies. There is no doubt that this is why the game was created. Not the most visually stimulating game ever, Bollywood Story still gives players something to enjoy. It is easy to learn and slow-paced enough for those who are new to online slots. The bonus round may not be the most exciting, but the addition of the flower garland wilds help. This gives players a compelling reason to keep spinning those reels. The anticipation of creating winning combinations is the main appeal in every slot machine. 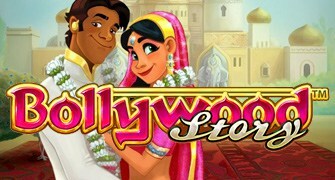 This game is a real treat for those who are familiar with Bollywood and those who are not. It has something to offer everyone. NetEnt took a theme that wasn’t widely used in the industry and transformed it. The result is the entertaining Bollywood Story.